The Jeweled Finger Coral has the appearance of hundreds of little jewels across its surface! The corallites of the Jeweled Finger Coral Porites cylindrica add an element of sparkle to the reef aquarium. This is because they are covered with many corallites that are very small, and each corallite has 10 tiny septa. It is the abundance of septa that give it the appearance of having been sprinkled with jewels all across the surface. They come in many attractive colors including green, blue, golden yellow, yellow, purple, and pink. These colors can be very vivid, and for many specimens the color will be brought out under high intensity lighting. In the wild, the Porites genus forms some of the largest coral colonies. They can reach massive proportions, with some growths reaching about 26 feet (8 m) in height. They are some of the longest lived species on earth. Based on their rate of growth, it is estimated that some of these large colonies can be close to 1000 years old. This is not a challenge for the reef keeper however, because they are very slow growing, averaging only 1/3 of an inch (9 mm) a year. The Jewel Coral, also known as the Cylindrical Finger Coral, grows in finger like projections that can fuse at the tips. They are found on back reefs and lagoons, in shallow water that is exposed with the tides. Very high lighting and strong, turbid water movement is needed. P. cylindrica can be difficult to care for, but once it is acclimated can be very hardy. You will know if your lighting is inadequate, because their bright yellow color will fade to golden brown or mustard. The Jeweled Finger Coral is best kept in a shallow display to best provide high light and fast water movement. The Porites genus has been propagated in captivity, and some beautiful captive grown specimens are available. Distribution / Background Porites Coral Information: The Porites genus was described by Link in 1807, with the Jeweled Finger Coral Porites cylindrica described by Dana in 1846. There are approximately 122 nominal species in the Porites genus, but it is still unknown how many of these are true species. The 16 species found in Australian waters are considered true species. Porites species have proven difficult to classify as individual species because of their minute calices. Some common names these corals are know for are Finger Coral, Jeweled Coral, Christmas Tree Worm Rock, Jeweled Finger Coral, Plating Jewel Coral, Jeweled Finger Coral, and Porites Coral. Some of the captive grown Porites have aquacultured names like Canary porites Coral P. cylindrica, Limited Edition Mike Paletta's Purple Porites, and Amethyst Porites P. annae. Status The Porites cylindrica is listed on the IUCN Red List of Endangered Species as Near Threatened (NT). 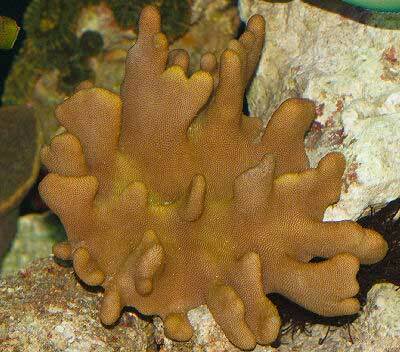 Description What do Porites Corals look like: The skeletons of the Porites genus are lightweight and porous. They have multiple growth forms that include flat colonies that are encrusting, flat leaf-like sheets, massive colonies that are dome shaped when large, and branching colonies. Colonies can grow quite large in size and some species can have several of the growth characteristics in one colony, as their growth formations are affected by water flow. Colonies of Porites can reach 26 feet (8m) in height and can be over 16 feet (5 m) in diameter. They are very slow at expanding, only growing 1/3 of an inch (9 mm) a year. Some colonies in the ocean that are estimated at over 1000 years old. Porites will often shed a mucous layer during the time of a full moon to rid themselves of waste, debris, and algae. The Porites genus corallites are small, submerged, and filled with septa. They are often confused with the Montipora corals as they both have corallites that are extremely small. However Porites have many differences in growth form, and their corallites are usually larger and more compact than those of the Montipora corals. The Montipora corals also lack the same type of septa. The Jewel Finger Coral P. cylindrica grows in finger like projections that can fuse at the tips. Hence additional common names including the Cylindrical Finger Coral, Jewel Coral, and Finger Coral. The abundance of septa the Porites genus have give the corals a jeweled appearance, as if jewels were embedded across the surface. The colors of Jewel Corals can be green, blue, mustard, yellow, purple, pink, as well as muted versions of these colors. Difficulty of Care Porites Coral Care: The Jeweled Finger Coral Porites cylindrica can be difficult to care for, but once it is acclimated can be very hardy. The species that come connected to your live rock tend to be the hardy species whose tentacles are out day and night while the harder to care for species can have tentacles out at night only, or during the day only. Foods / Feeding Porites Coral Feeding: In the wild, small polyp stony (SPS) corals have developed several feeding strategies. Through a symbiotic relationship with a marine algae, known as zooxanthellae, they receive the majority of their nutrients. They also capture planktonic organisms and microscopic food particles from the water column and can absorb dissolved organic matter. The small tentacles of the Porites species however, make capturing planktonic foods less viable than for other SPS corals. A well-feed live rock/reef environment is what is needed for your Jeweled Finger Coral, along with some fish for organic matter production. A mature tank is recommended. Like other Porites, the Jeweled Finger Coral is best kept in a shallow display with high light and fast water movement. House them with fish and stir up the substrate to release organics into the water column. Make sure that no other corals can come in contact with your Porites. The Jeweled Finger Coral is not aggressive, but position it with plenty of room between it and other corals for its protection. Availability Porites Corals for Sale: The Jeweled Finger Coral Porites cylindrica is moderately easy to find at pet shops and on line. Online they can run about $40.00 to $60.00 USD or more depending on size and/or color.